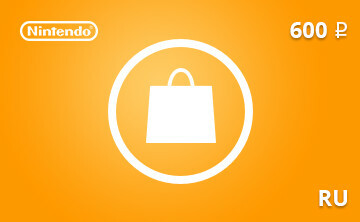 The gift card of Nintendo eShop enables you to replenish the balance of your Nintendo eShop purse in rubles. Now you can give your friends games and in-game items that are bought for money. The purchase of the Nintendo eShop card takes place instantly. Immediately after payment you receive a unique card number and pin-code card. How to activate Nintendo eShop? 1. Start Nintendo eShop from the HOME menu on the console. 2. Click on the Menu in the upper-left corner of the lower screen. 3. Select Use the download code. 4. Enter the 16-digit download code on the screen that appears and tap OK.
After activating the card, your account will be credited automatically to the amount of 600 rubles.